Next Post Christmas Jumper Day – Update! So sad 😦 what an amazing man!!! I defenetily!!! Agree!!! because nobody should be lonely and we should love each other and love each other for ALWAYS!!!!! It is so sad that Nelson Mandela has died R.I.P to a awesome man who showed the world how to forgive and how to love. I definatly agree with what he said!!! My mum has his autobiography, Long Walk to Freedom, a really thick book and I am going to read it when she finishes reading it!!! R.I.P what an inspirational role model I agree because people should always be loved, however hatred comes from other people around us. I agree with nelso mandela everyone needs to love someone in there family members. I agree because nobody is born to hate they are born to love and forgive.You learn to hate and love ,you are not born to hate a person that your friends or familly don’t like. R.I.P Nelson Mandela with the angels in heaven. I 100% agree with you Harry. 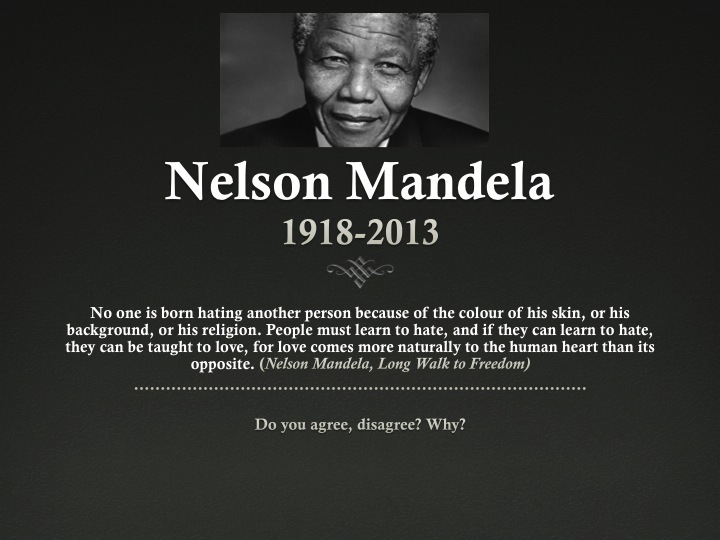 RIP Nelson, you were my idol. I agree with Nelson because it’s like being born and knowing your alphabet, it’s impossible!so therefore people must be influenced by there surroundings to hate so then if that’s the case, they can be influenced to do other things too. Such as, love people or things. and he is not gone he lives our hart.